Virgin America markets itself as the hip way to fly. Investors are apparently on board. The upstart airline formed by billionaire Sir Richard Branson soared 25% out of the gate Friday from its IPO price of $23. The deal raised more than $300 million. The company is based in Northern California and now worth about $1 billion. It's going public at a time when airline stocks are flying especially high. Delta (DAL) is up over 60% this year, for example, while JetBlue (JBLU) has climbed almost 50%. Fuel prices are low and more people are traveling for business and pleasure as the U.S. economy improves. Will hip work on Wall Street? 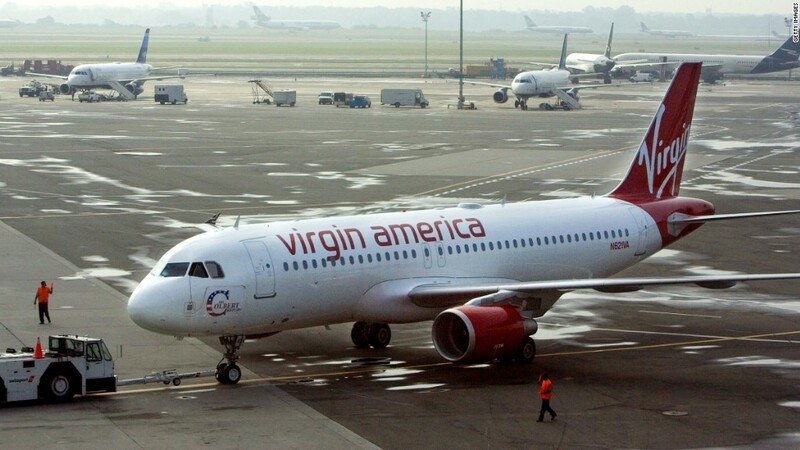 Virgin America is much smaller than its airline rivals though. It lost $395 million from 2009 through 2012 before eking out a $10 million profit last year. The airline is marketing its turnaround heavily to investors. In the first nine months of this year, it's made $56 million, according a regulatory filing. Where the airline has excelled is differentiating itself in a crowded market. Its planes have names such as "Virgin & Tonic," and "Jefferson Airplane," and its cabins feature purple mood lighting and leather seats. Its inflight safety demonstrations are highly produced pop music videos. Its launch parties are celebrity affairs. Everything it does reinforces its mission to be a hip alternative to the traditional (and largely hated) flying experience. The Branson effect: While Virgin America got its name from Branson's Virgin Atlantic airline, it is not majority owned by Branson, Virgin Atlantic or Virgin Group. That's because Americans must own most of an airline in order for it to fly between U.S. cities. Cyrus Capital Partners, a distressed debt fund manager, is its largest single shareholder. The Virgin America IPO occured just days after the public debut of Branson's financial services firm Virgin Money, a deal that valued the company at around $2 billion. It also comes just weeks after a spaceship from Virgin Galactic, Branson's space tourism venture, exploded over the California desert, killing its co-pilot. The British businessman has vowed to continue with the space endeavor. The carrier's primary hubs are Los Angeles and San Francisco, but it's expanding operations at New York's La Guardia Airport, Washington's Reagan National and Dallas' Love Field after the Justice Department required American Airlines and US Airways to give up some gates as a condition of approving their merger. Virgin America has also expanded its routes to Mexican hot spots Cancun, Cabo San Lucas, and Puerto Vallarta. -- Correction: An earlier version of this story included an erroneous valuation for Virgin America.